What would happen to earth after a third world war? Most of us would think there would be nothing left after such a war if at all it occurs. Many of the science fiction give us the dire picture of earth as a radioactive, uninhabitable planet but humans surviving by spreading across the galaxy. Then there are other works of fiction which theorize that small pockets of humanity would survive but would lose most of the technology and revert back to primitive ways. Phillip Reeve has come up with a very innovative vision of how human life may be after a third world war. It is one of the rare children’s science fiction rather than fantasy. But still I put it under my children’s fantasy as I have not seen too much of children’s science fiction as such for it to stand as a genre by itself. Also this particular book, in terms of science fiction concept has sufficient novelty to stand among adult science fiction. But since protagonists are children and the book is written targeting a younger audience, I include it under children’s fantasy. Without any more delay, let me get to the concept. 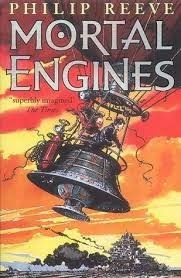 The title of the series itself aptly described the concept – mortal engines. We often talk metaphorically of cities having life of their own. Phillip Reeves has interpreted this idea literally and conceived the concept of live cities run by engines. In a post-apocalyptic world, most of the land has got destroyed. People are now living in mobile vertical cities that grow by cannibalizing smaller cities, breaking them apart and absorbing whatever technology and metals it may contain and taking on its people as slaves. While cities are fighting against each other, there is a group called anti-tractionists who feel this very concept of cities on wheels is evil and are fighting against it. Then there are pirates who live by stealing stuff from cities. Like real life, every group has people of different shades of good and evil. The protagonists are members of these different groups, each having his or her distinct personality. The story, told in five books, deals with their interactions, their evolving relationship with each other and how they shape an evolving world. This book is one of those books that manage to create truly grey characters. We do have heroes and villains. But then heroes have strong negative traits and some of the villains also have that silver lining in the dark cloud. And then there are those who are heroes for some part of the story and villains in other parts. That way it is a better representation of the true world compared to most fantasy where characters end up being black and white – often similar to each other except for minor quirks. Here on the other hand multiple characters remain with you as unique, distinct personalities. From a science fiction perspective, there are a lot of unique details about technology and gadgets that make it an interesting read. One can clearly see the author has really thought through his entire concept unlike a few other authors who just try to cash in on just a single high level science fiction or fantasy level concept. As a story, it is very gripping and the plot is maintained quite taut. If I were to point one negative aspect of this series, it is that it lacks that feel good element. By and large, the general feeling is dark and depressing for a children’s novel. There are bright moments but I would have expected a light children’s book to be much more fun. Also I think the violence may be a bit on the higher side for a younger audience. That aside this is definitely one of the better books written in recent times in terms of breadth of imagination and the plot execution. Does seem more fit for an adult audience - in terms of mood - than children. Though, seems to me, that the children of today are accustomed to reading a darker brand of fiction than we were. Yeah Suresh - that is what I felt. I have read several post-cataclysm stories and most of them were dark like the one you have reviewed here. The concept is novel indeed and more than children, it may appeal to young adults addicted to Game of Thrones et al. Actually adults can also draw some metaphorical significance and enjoy this work, Umashankar. But definitely not the smaller children.